The answers are seldom obvious, especially when they appear obvious. 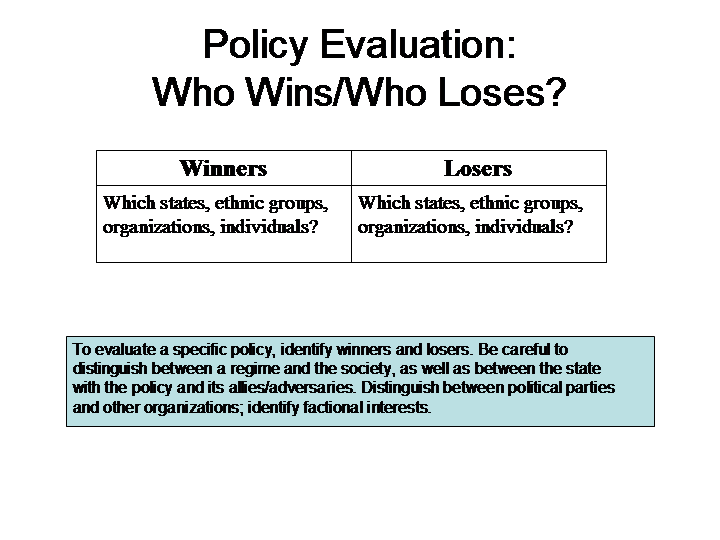 After all, the art of politics is to convince you that, “Trust me; you are the winner!” The chart below can help you come up with a realistic answer. Time. The next step is considerably trickier: distinguishing winners from losers over time. The answer will almost certainly change when time is incorporated. The main point is to be aware that the time frame will affect the answer. The way in which the policy is implemented will of course also affect the answer. Now, we are getting deeply into system dynamics [see Page V. System Dynamics]: only an evaluation of the causal dynamics underlying behavior in a specific domain will enable one to judge the relationship between the way a policy is implemented and its ultimate impact. 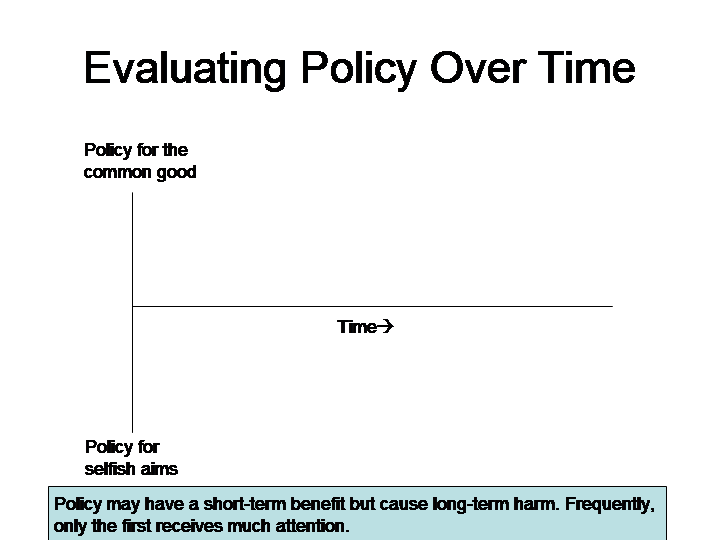 In preparation for an evaluation of dynamics, the first step is to recognize the obvious but frequently ignored point that the impact of a policy is quite likely not to be linear. In war, disaster may quickly follow a glorious victory. A financial policy that provokes a rapid rise in apparent wealth may cause a bubble, which will of course inevitably burst. A policy touted as in the common good may quickly prove to have benefited only a few individual members of the ruling elite, and perhaps even them only over the short-term. The theoretical point is an obvious, if frequently overlooked, warning. More valuable is the next step – an analysis of the anticipated impact of a specific policy. 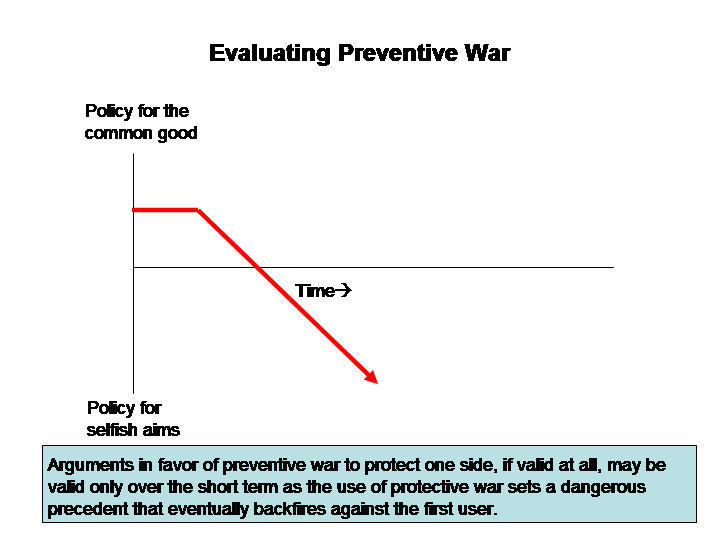 In general, one may assert that preventive war has some short-term benefit for some group (perhaps not all of mankind but at least for one society) but that the long-term impact on all is likely to be negative as the precedent of preventive war undermines international law. Over what period of time do they benefit? How should benefits be weighed against losses?